What is a Assault Rifle? | ASK Defensive Training Co.
What is a Assault Rifle? Home TrainingWhat is a Assault Rifle? 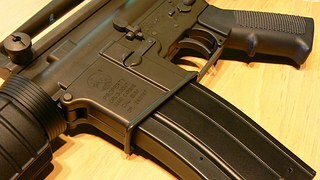 An assault rifle is a selective-fire rifle that uses an intermediate cartridge and a detachable magazine. Selective- Firearm has at least two firearm modes, which are activated by means of a selector which varies depending on the weapon’s design. Some selective-fire weapons have burst fire mechanisms to limit the maximum number of shots fired automatically in this mode. Intermediate Cartridge is a firearm cartridge that is less powerful than typical full-power battle rifle cartridges such as the United Kingdom .303 British, Russian 7.62×54 mm R, German 7.92×57 mm Mauser or United States .30-06 Springfield, but still have significantly longer effective range than pistol cartridges. Detachable Magazine means any ammunition feeding device, the function of which is to deliver one or more ammunition cartridges into the firing chamber, which can be removed from the firearm without the use of any tool. So is the AR-15 a assault rifle? What does AR-15 stand for? So why is the media calling a AR-15 an assault Rifle, in one word ignorance, it is designed to scare the general public in believing that these rifles are BAD. And because the general public doesn’t know any better, they believe it (because the media doesn’t ever lie or exaggerate anything, RIGHT). The AR-15 rifle is one of the most versatile firearm designs I have seen in my lifetime. It is certainly not a assault rifle.